Examples, solutions, videos, worksheets, games and activities to help Geometry students learn about inscribed and circumscribed circles. How to construct Inscribed and Circumscribed Circles using incenter, circumcenter, or centroid? The following diagram shows how to construct a circle inscribed in a triangle. Scroll down the page for more examples and solutions on circumscribed and inscribed circles. A circle is circumscribed about a polygon if the polygon's vertices are on the circle. For triangles, the center of this circle is the circumcenter. A circle is inscribed a polygon if the sides of the polygon are tangential to the circle. For triangles, the center of this circle is the incenter. Circumscribed and inscribed circles show up a lot in area problems. This instructional video describes the basic concept of Circles, Triangles, and Squares that Circumscribe and inscribe each other. 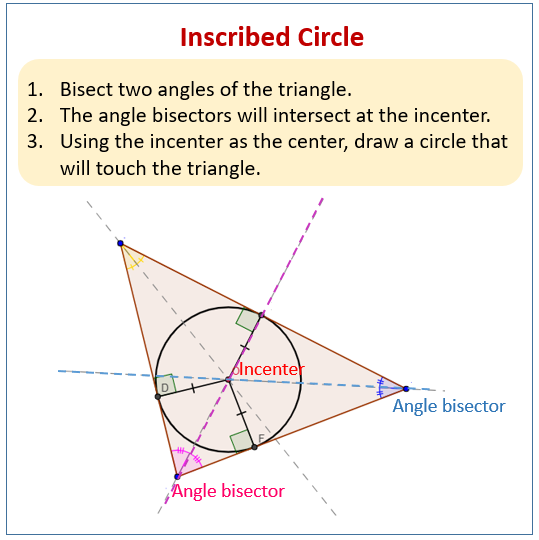 Use the incenter, which is where the angle bisectors intersect, to draw a circle that circumscribe a triangle. Use the circumcenter, which is where the perpendicular bisectors intersect, to draw a circle that circumscribe a triangle. Use the centroid, which is where the medians intersect, to draw a circle that circumscribe a triangle. How to Draw Inscribed and Circumscribed Circles? Tutorial on how to construct inscribed and circumscribed circles manually using pencil, paper, a straight edge, and a compass.